Here's Ron Belliveau's suggested packing list for 1995. Excellent advice, follow it closely! MT will have seine nets at the reserve, as well as tubs to hold our daily catches. You should consider bringing a couple personal buckets along for those special fishes you will undoubtedly collect. We will put most of our catches into the collection of tubs and divvy them up at the end of the week. The personal buckets can be handy for isolating special fishes. Last year I bought 2 bait buckets from K-Mart, about 1 or 2 gals., with snap-on top and trap door. Tied light rope/cord to these and used them in the field. You will want to do this. Also used them for isolation containers and later transferred fish to bags in my cooler. You may want to bring a notebook or journal for taking notes but I found a pocket sized tape recorder to be most useful. Also consider bringing a magic marker to write locations/identifications on you fish bags. It's really great to get home and know that a certain fish came from the Atun Cocha, etc. You should have or be lining up a dip net. 1/8" mesh, 6-8" pocket and 12-15" square opening. A 2-3 ft handle will suit most fishing locations. Two nets are better than one. It is, after all, a critical piece of equipment. Also, bring fishing gear if you can fit it in. There should be ample opportunity to "wet a line". Typical catches from baitcasting during the day might include peacock bass, piranha, arowana, pacu, or other characoids or cichlids. Fishing at nite will produce a multitude of catfishes. How's fried tigrinis cat sound? Once again, you will need a cooler to transport/ship your fish. I DO NOT RECOMMEND A COOLER LARGER THAN 56-60 QUARTS. Because tropical fishes are a major export of Peru, coolers larger than this may cause problems with Peruvian customs. You can pack it will expendable supplies for the trip down, fish for the trip back. I use an Igloo Cool Roller (~$35 US.) . Handle on one end: wheels on the other. Add a dog leash to the handle and it is much easier to use than a two handled cooler filled with fish. Bring several large plastic bags for fish and don't forget rubber bands. Plan to double bag everything. I brought some styro box sized shipping bags to put all in, in case a bag broke. I suggest 40 - 50 fish bags in the 12" long range. Bring junky clothes for use in the jungle. Plan to leave them for the locals or crew after they become dirty. They really can use them and it leaves more room for bringing back goodies from Iquitos. Last year I bought 3 pair of cotton pants from one of those military outlet stores for about $5.00 total. Shoes are really your own choice but consider something that is comfortable (will be sweating) and that will dry out over nite. I recommend 2 prs, one to wear while the other is drying out. A backpack or fannypack (waterproof or resistant) will be very helpful while out on a hike. I also used a money belt that could fit under my shirt so that I would not need to carry too much $$ in my pockets. Also, if by chance you loose your wallet, the better part of you cash is still with you. Personal hygiene items should be packed as you would for any other trip, yet keep in mind that you will need a week's supply. Avoid sweet smelling soaps, deodorants, and perfumes, they only attract insects. Use only unscented personal toiletries. Other items to pack include a few plastic trash bags and some zip-lock bags. Storms can come up very quickly in this part of the world and plastic bags can be used to keep gear (like your camera or tape recorder) dry when out on an excursion. A light weight rain poncho is also advisable. A good waterproof flashlight is essential for night walks & fishing, and for spotting caiman and other game. A good knife is always useful. A small pair of high powered binoculars are a must for bird watching and scanning the shores from the boats. Definitely bring a camera to capture your adventure. There will be plenty of photo opps. The kind of equipment you bring is your choice, but keep in mind the ease or burden of carrying your gear when hiking or out in the boats. Your equipment will also be exposed to high humidity. One of those zip-locks might come in handy here. 100 ASA film will do for most jungle shots with higher speed film for night walks or deep jungle. Remember to pack plenty of batteries for both camera and flash. If you bring a video camcorder, the available voltage for recharging is 220, so bring an adapter (for S.A. fixtures). Be sure to bring sunscreen and mosquito repellent containing DEET (95% active). You will also need a wide brim hat. I also suggest 2 pr of sunglasses (UV blocking is recommended). About $150 - $200 should be plenty of cash for the trip. Some money for shopping in the city, fish export fees, tips for the crew/guides, bar bill, and purchases at the fish wholesaler if you are not satisfied with what you bring out of the jungle. Bills over $10 will be very hard to cash (I suggest ones and fives). We should have time to do some shopping in the city. Will also be able to some bartering with the natives. Many of the things we take for granted are excellent bartering items. Colorful T-shirts, ball caps, fish hooks & monofilament line, cosmetics, lighters, D-cell batteries, ink pens, notebooks, inexpensive jack knives (swiss type are popular), are all good trade items for adults. Small toys and hard candy (not chocolate - melts!) are popular with the children. In return you should be able to negotiate beautiful handmade native artwork, possibly blowguns, hammocks, paddles, or services (porters, guides, or collecting assistants). You will be amazed at how valuable a t-shirt can be to a Riverino. You may wish to bring some dehydrated powdered drink and a plastic container with lid, with you. MT will have pure water, and I expect softdrinks and beer, however, last year I was really glad I brought some Crystal Lite with me. And my second can turned out to be a valuable item as a tip to one of the crew. Be sure to bring your fish medications! Bring antibacterial and an antiparasitic drugs as well as stress coat and oxygen tablets. These things will save fish lives. Albert will be sending your Faucet air tickets by registered mail a few weeks before departure. If you have not received your tickets 10 days before the trip please give him a call. Also, when leaving for Miami, DO NOT CHECK YOUR LUGGAGE THROUGH TO IQUITOS, but only to Miami. Hand carry your passports, medical documents (get this with your shots), cameras, film, medicines and any other irreplaceable items. T's: men's med. & lg. 2 ea. Leave trip info for spouse! The Igloo Cool Roller illustrates this list pretty well. Ron is at a wheeled blue correct-size cooler, bait bucket on top. Plastic bag and marker in hand to record the collecting site of his specimens. 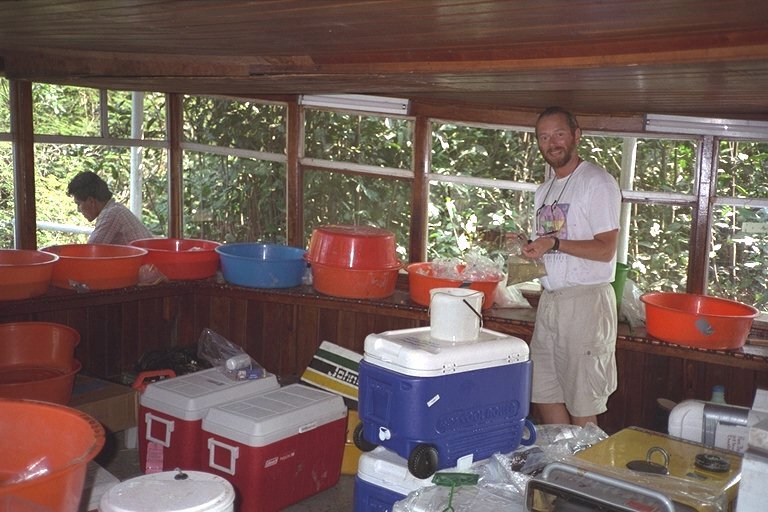 Ron's cooler is the open, war-torn lid to the right - he's transferring fish or changing water from the bait bucket or vat behind him to the open cooler. It pays to be organized! Note large colored vats on bench - these were supplied by the tour operator. Fish we didn't bag immediately were left there for sorting. Each person had a vat. Jumping fish was prevented by covering a vat with another vat, as at left of Ron. There's a small green net at the bottom center of the picture - useful for transferring fish from vat to bag. Ron has sensibly strung his sunglasses around his neck. I (Francis) can't overemphasize this: get good nets and get them now: they take 3 weeks to make and send by mail! Don't leave it till too late - I did and ended up with substandard nets, which were close to useless in the environment, and so had to rely on the generosity of others who lent me theirs. These are perfect so I recommend them. The net is going to get full of pounds of leaves and mud and is going to be used to poke around under logs. These are not butterfly nets! Plastic handles or plastic rims will break (even on nets designed for fishing)! You will need your own personal fishing gear: nets, bags, drugs, etc. More on this another time. Did want to recommend Whale Enterprises, Inc., as a supplier of great fishing nets. They are @ 2795 Rabbittown Rd., Piedmont, Al. 36272. I picked up 2 of the following last June for a total of $34 U.S., including shipping. BN wire 12" x 1/8" net w/2 pc 30" handle. It is 12"x12" with 1/8" mesh - gd for most fishes you might want. The 30" handle has a button you can push to break it down into 2 pieces so it can fit in a large suitcase. The bottom rim of the net has a rubber guard for protection. Very nice fishing gear! My trusty ruler shows the opening to be 12 inches x 12 inches. Looked on the invoice and it does not specify the opening. The catalog number is - well, it doesn't have one of those either. I guess your best bet is to refer to me (Ron Bellivea), change the opening to 12 x 12, and you could reference my invoice number from last year: 95-186. Good luck. Remember that they begin work very early in the morning and the lady I dealt with, Vickie, was usually gone by 1:00 or 2:00 PM CST. You have the ph # correct.